Design is our future. Have you heard that phrase before? People are writing books about it, TED is talking about it, and innovation consultancy IDEO is banking on it. Design helps innovators dream big, while dreaming big on something that people really need. So why should you care? Because our kids are our future, just like design, and if they’re better prepared for the modern world, the modern world will get better. Keep reading for an overview of Design Thinking and a fun building challenge to introduce it to your kids. Design Thinking is a methodology used by designers to help them solve complex problems and create solutions & products that meet people’s needs. It’s solution-based thinking that starts with a general goal, not just a specific problem to help create broader ideas. d.school, Stanford’s Institute of Design, is also at the epicenter of the Design Thinking movement. They utilize the following framework to help their students (and the companies who hire them as consultants!) create products that meet people’s needs. Empathize: The first step is to research your customer. What makes them tick? What needs do they have? Emotional or physical. What do they like? Ideate: Explore potential solutions through brainstorming. Quantity is key here!! Sometimes good ideas can be lost when we allow ourselves to filter too early. Prototype: Prototyping takes ideas from paper to physical form. Interacting with the prototypes helps develop more empathy and learn where improvements are needed. Test: The product can be tested by using it in its final form, recording and responding to observations and talking to your customer about it. Now it’s time to put all that theory into practice! 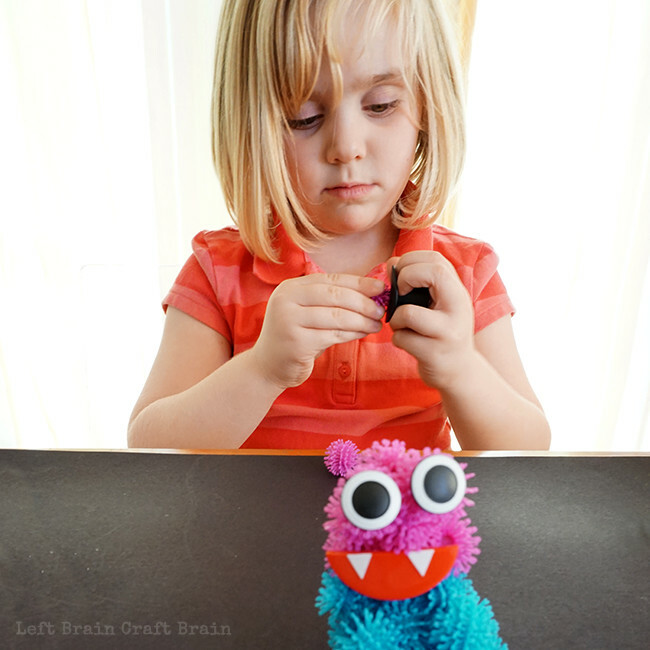 I’ve put together a fun challenge for your kids, either at home or at school. 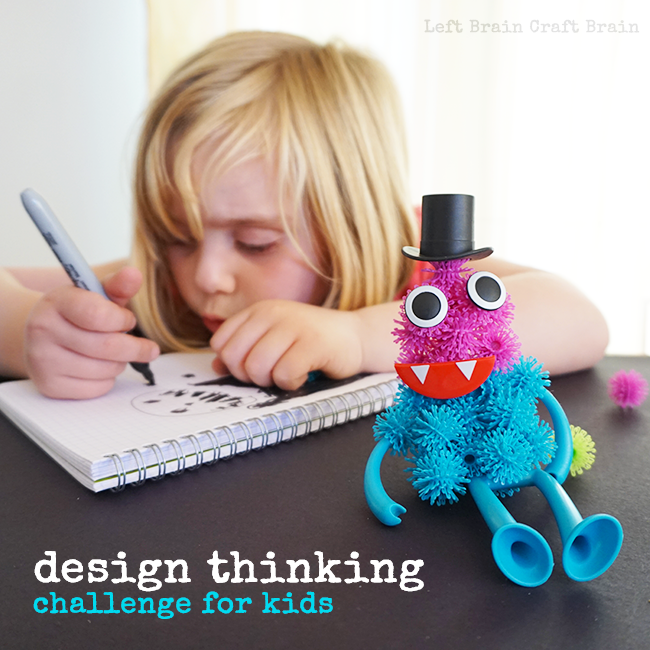 You’ll task them to create something using Design Thinking. Pick something they love to build with. You need some sort of building toy for this challenge. 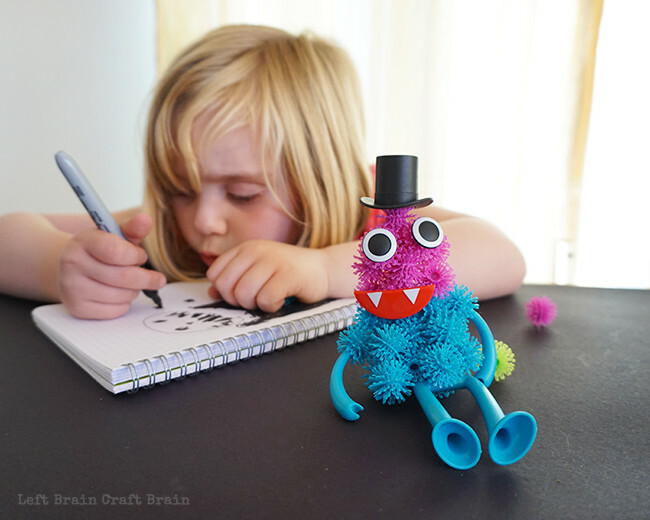 I picked Bunchems, our newest favorite creative parts. They’re these little colorful balls that you just squish together to create whatever 3D sculpture you want. They’re super easy to use for my nearly five year old’s hands, plus clean up is easy peasy because they stick together. Safety note: Make sure your kiddos keep the Bunchems away from their hair because they can get tangled. Give them a challenge. 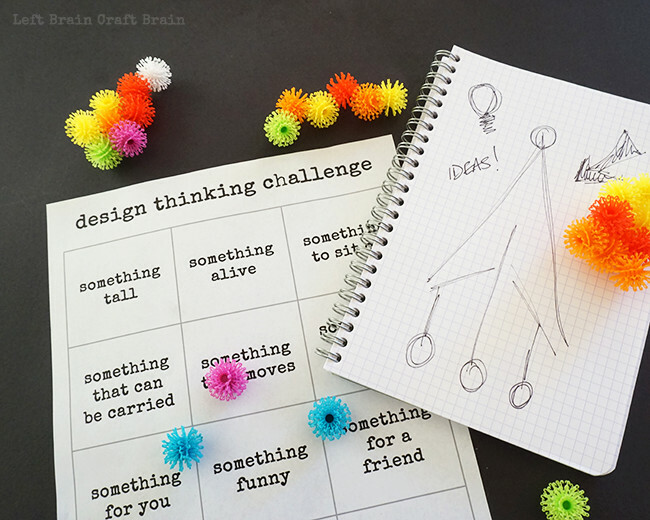 I’ve made this Design Thinking Challenge Prompts printable for you to use. Each prompt is what their customer is looking for. Empathize. One of the things that the Stanford Design School emphasizes in Design Thinking is the need for empathy in the design process. 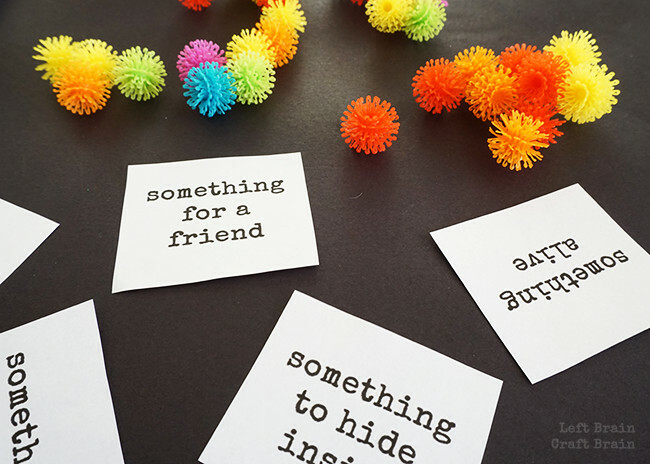 To help reinforce some empathetic thinking in our kiddos (which can be developmentally difficult, especially before the age of eight), I added a challenge that’s all about creating something for a friend. For the rest of the challenges, have them pick someone they are designing for. To help facilitate this conversation, ask questions about their customer. Define the challenge. The prompts are intentionally vague so that kids can be creative. It was fun to hear my daughter list the things that she thought fit the phrases. What type of things could meet their customer’s needs, in this case for something tall. They were often things that I hadn’t thought of! Just goes to show that everyone comes with different perspectives and different ideas, all of which are worth listening to. 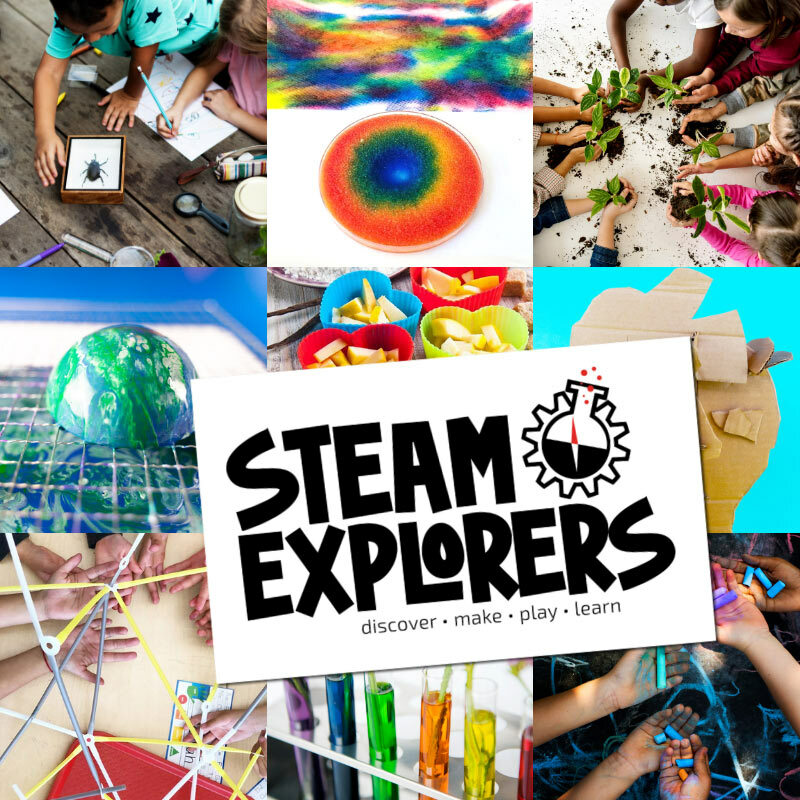 One of the things I love about this activity is that it’s easily modifiable for different ages. My daughter can’t read or write yet, so I helped out with some of the lists and kept her going with questions and prompts. But an older kid could do this independently or in a small team with others, minimal adult supervision required. Ideate. My daughter decided that her something tall would be a vampire. 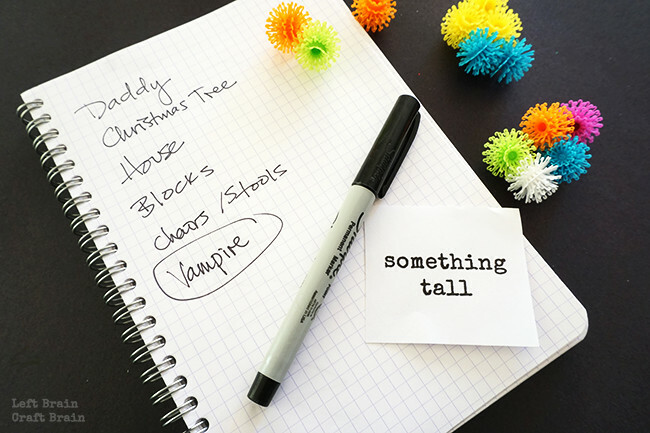 (Are your littles vampire intrigued like mine?) 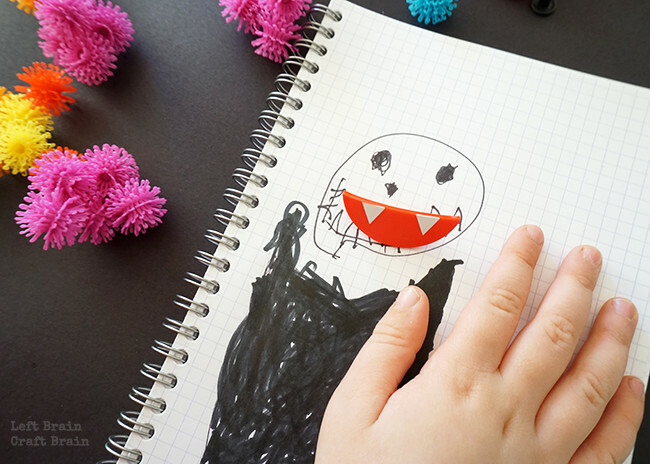 Her next step was to draw out a vampire and play with parts to come up with building ideas. 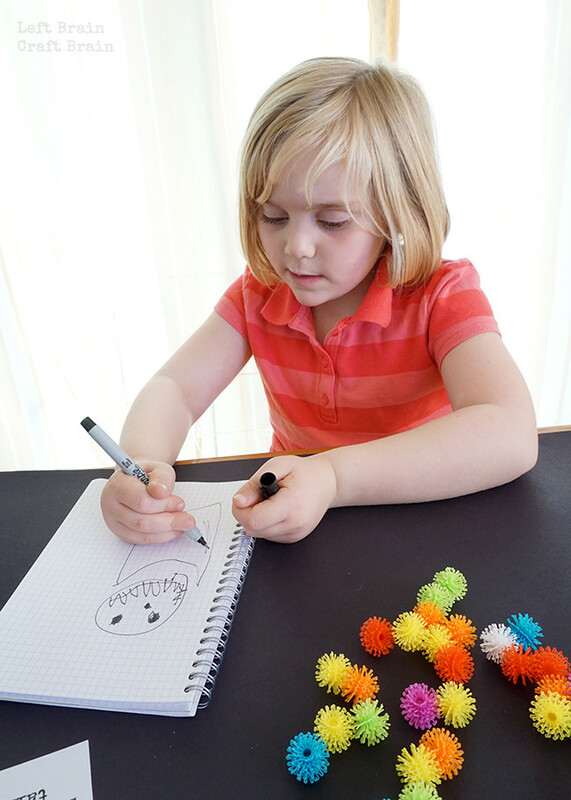 After she drew out her design, she started playing with the parts. She bunched the Bunchems and testing out the fun face pieces that come with the set. These teeth were a definite vampire winner! Prototype. Now she was ready to build her vampire! This process can be repeated until the end result is what the customer (and the kids) want to dream up.